A day before our houses were invaded with guests fellow Bread Baking Babe and friend Monique (Living on Bread and Water) and I took a time-out to bake cookies together. Knowing our ability to blab and laugh a day to darkness we decided we would best prepare some different doughs and do a dough-exchange instead of baking cookies. She prepared Crinkle cookie dough and Peanutbutter pecan chocolate chip cookies, I baked Mandel bread, Cinnamon roll cookies and had dough for lemon-poppyseed slice&bake ready for her in the fridge. We exchanged doughs. We talked. Had coffee. Talked some more. Ended in the kitchen anyway at lunchtime and browsed a little booklet Monique had with her. Decided to bake. Improvise. We stirred a dough very much like this one. Instead of using a piping bag (which we tried but the dough was far too stiff to be piped) we rolled marble sized pieces of dough, placed them in mini-muffin tins and paper cups. I'd mixed an equal amount of caramel and sweetened condensed milk and that became the base for the topping. We proceeded to place (carefully; with a keen eye for composition!) 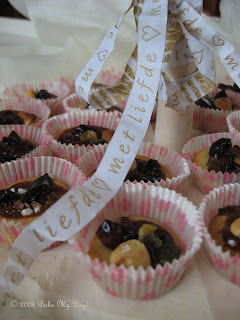 various nuts and candied fruit in each and every cup. Sprinkled some tiny sugar pearls on top and in the oven they went. 15 minutes 160C. They looked so adorable in their pretty paper cups, we hardly waited for them to cool and sampled.... Nothing! Absolutely tasted like nothing! How could that happen? A bit desillusioned Monique returned home with her stash of cookies and dough. I cleaned the kitchen, my dough in the fridge, put the kettle on and nonchalantly grabbed another one of the pretty/non-tasting cookies. I loved it! Cooled they tasted of almond paste cookies, the caramel came through and the nuts were a welcome crunch! Quickly texted Monique to not throw them for the dogs (aka kids). Lesson learned: not every cookie is great right out of the oven! This one needs a thorough cooling and will keep for a couple of days! The cookies looks so festive! Must have been a great day having fun together. That ribbon really fits the bill! Those look like great cookies! I know what you mean about having to let them cool before the taste comes out...! What...? Didn't I even stayed to help you clean your kitchen ? Bad me ! But at least I was home before dark ! It was a very LOOOOONG morning coffee....! Have to do it again soon.Then I stay to fix the mess. And bring my sleeping - bag. I want to come next time too! It's not too hard for me to fill in the blanks and know you guy were having a ripping good time!